Have your kids left the nest? Have you looked at your single-family home recently and thought, “Is it worth all this work?” Or are you looking to move to a more energetic part of the city? Then perhaps the condominium lifestyle is for you! 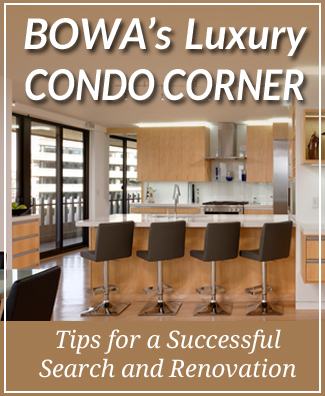 Listen here to Steve Kirstein’s condo remodeling tips. When it comes to selecting the right unit for your family the available inventory is greatly expanded when you’re open to the idea of remodeling. However, without the right team, the process can be challenging. That’s where BOWA comes in. Our experts can guide you through the entire process beginning with purchase consultations, through design, construction and beyond. We even offer our Peace of Mind Promises to to address those common remodeling concerns and allow you to move forward with confidence. One of our resident condo remodeling experts, Steve Kirstein, recently spoke on the Eric Stewart Radio Show and gave the inside scoop on how to make your condo remodel as smooth as possible. Listen here and then contact us when you are ready to transition to life in a condo!